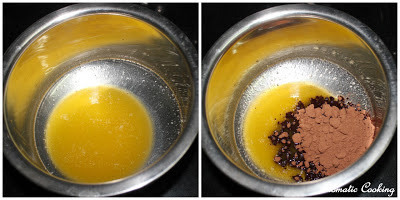 Today is Feb 27th, the day we are supposed to reveal this month's challenge in the Eggless Baking Group, usually Gayathri would have posted by now, but today I didn't see her post yet, so I double checked again whether it is the day. 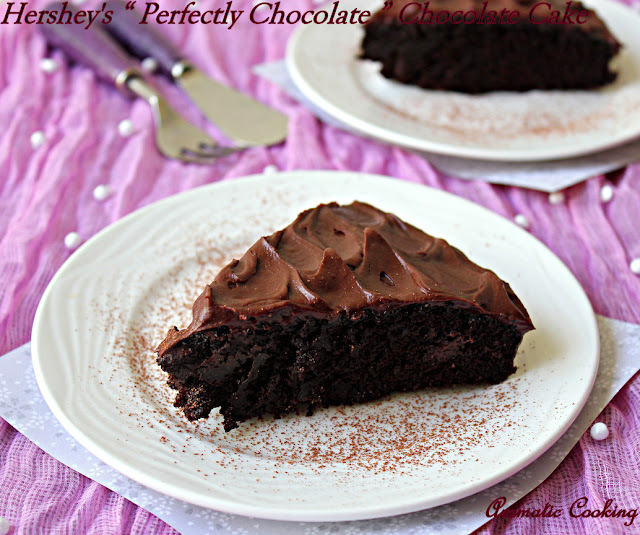 Well, " Perfectly Chocolate " Chocolate Cake from Hershey's Kitchen was the challenge chosen for this month. 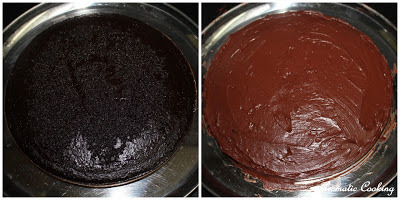 The main ingredient is Hershey's Cocoa, which I had with me, this cake is definitely for chocolate lovers, it's in and out, all chocolate, my daughter simply loved it. The best part was the frosting, couldn't help myself licking my fingers (well I washed them before touching anything again). I have used a simple technique to do the frosting which doesn't require any cake decorating skills or gadgets, but still gives the finished look. 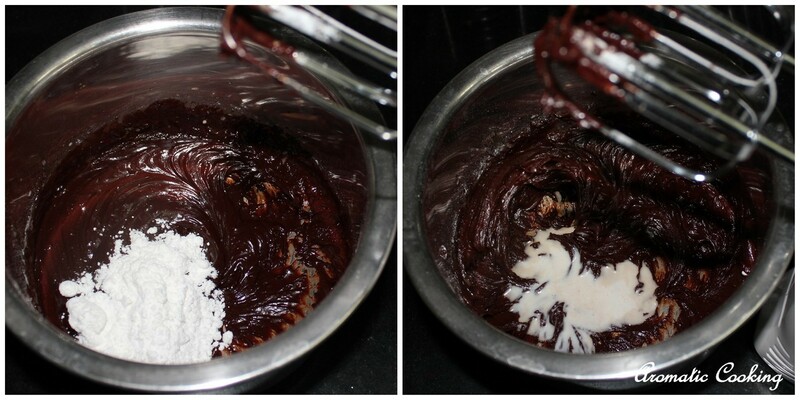 Here's to all the chocolate lovers out there..
Sift the flour, cocoa powder, baking powder and baking soda. 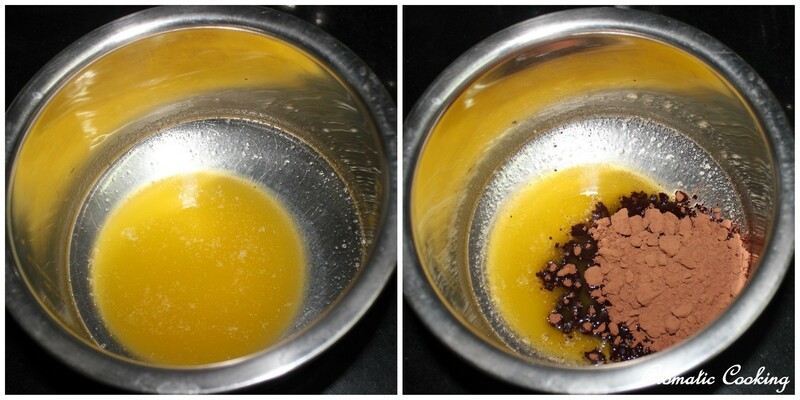 Take the milk, yogurt, oil, hot water, sugar and vanilla extract and beat it for a couple of minutes till well mixed. 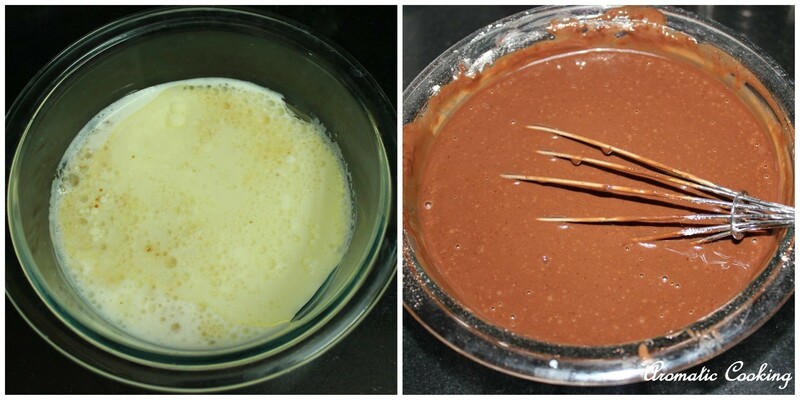 To this add the sifted dry ingredients, little by little and mix into a smooth batter. Grease and prepare a 9" round pan. Pour the batter in the pan, tap a little for the bubbles to settle ( a tip from the Wilton course). Bake at 180 C for 30 to 35 minutes, till a toothpick, pricked in the middle comes out clean. 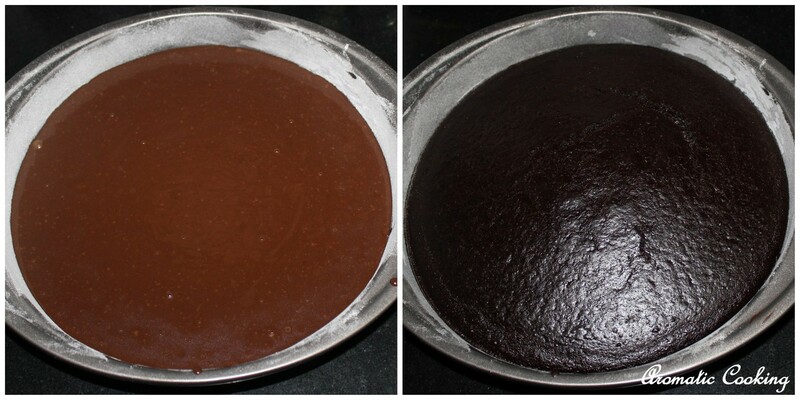 Wait for the cake to cool down a bit, for about 10 mins, remove the cake from the pan and cool it completely. For the frosting, first melt the butter, to it add the cocoa powder and mix well. Then add the sugar and milk alternatively and keep beating till you get a smooth frosting, finally mix in the vanilla extract. 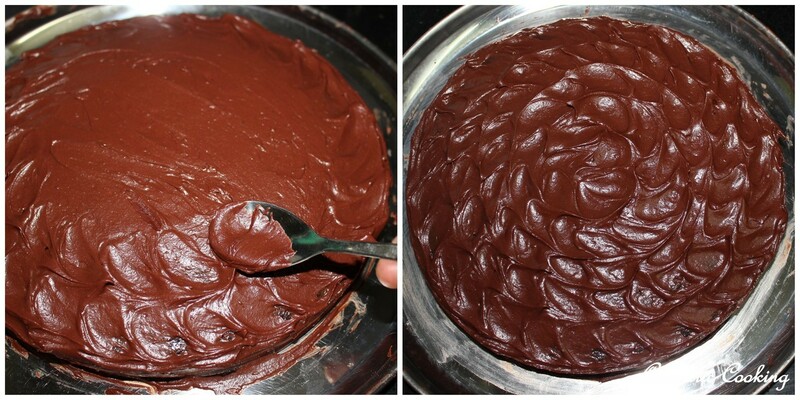 To frost the cake, first apply a thin layer of frosting with a spatula to smooth down the crumbs, then apply the remaining frosting and try to make it as smooth as possible with the spatula. For doing the edges, take a little frosting, apply it slowly on the edges clockwise, while turning the plate anticlockwise. Now take a spoon and slide on the frosting with the back of the spoon, do a complete circle, then do a second circle and so on, till you come to the center of the cake, this gives a nice look to the cake. It's best to make the cake overnight and do the frosting the next day morning, that way, the cake will be well cooled, another tip from the Wilton course. If you don't have confectioner's sugar, use powdered sugar along with a little corn starch, about a teaspoon to 1 cup of sugar. You can decorate the cake further by using some decorative sprinkles. Also you can make a layered cake, do two cakes, apply some frosting on one, place the second cake on top and proceed with the decorating, you have to double the amount of frosting. Love the icing part, super delicious. Well done. I too prefer Hershey's cocoa powder for chocolate cakes, your cake loooks so moist, soft n delicious, the color is so tempting...liked ur icing pattern, simply superb! Absolutely sinful, wish i get that slice, droolworthy cake and very attractive. Beautiful cake that looks moist, I love your cake decorating idea. 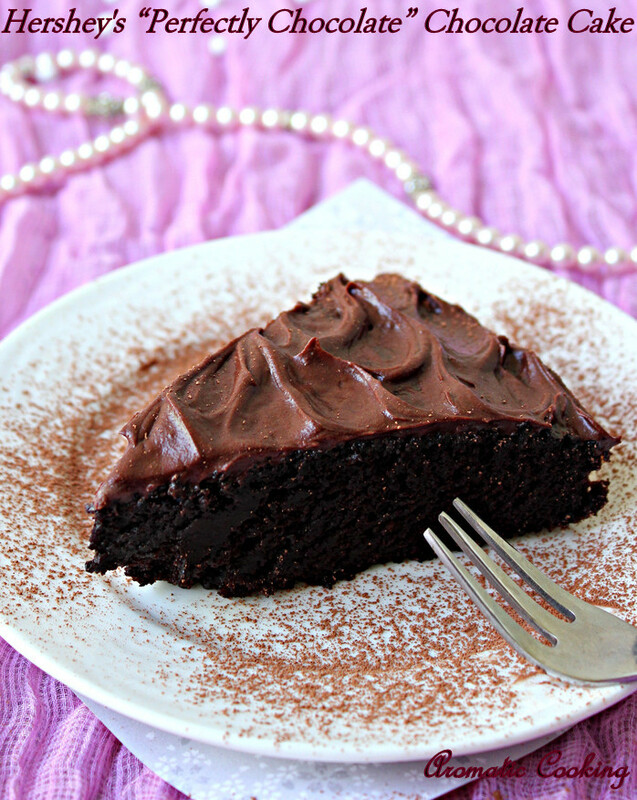 Yummy chocolate cake with chocolaty frosting dear,loved it! yummy moist cake, looks tempting..
Super yummy cake. Looks very moist and beautiful. The cake looks perfect. And as you say, best to make it at night and allow it to cool. I found that gives the best results. Just saw it at Priya's and I'm salivating here again! Please pass me some ....Totally drool-worthy !!! Wow! It's my favorite chocolate cake.I want to eat some right now. Wanna grab a bite.. Looks so delicious.. I better bake this one soon. Wow! Chocolate! I'm craving now. I love that dessert.